A contemplative journey and ceremony of gentleness. August 2015. Redmond, WA. 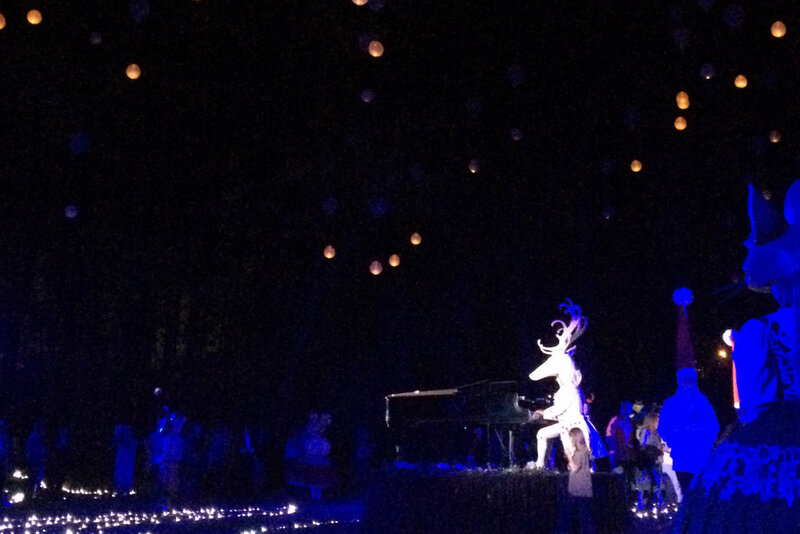 In Redmond’s Heron Rookery, at the center of the wood, the Great Stag of the Moon sat at his grand piano in the heart of an illuminated labyrinth. Beneath an immense floating chandelier, this virtuosic creature serenaded audiences with nocturnes, barcaroles, and sonatas. 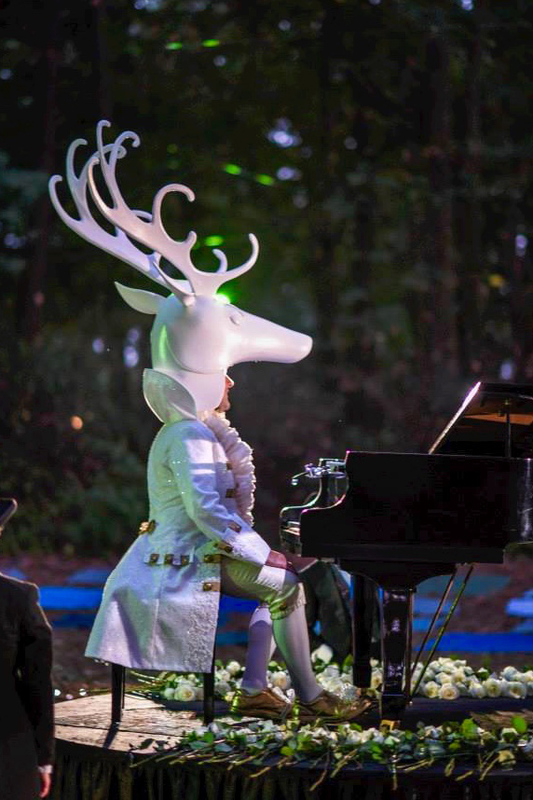 Gentle woodland creatures invited audiences to walk the labyrinth, drawing them ever closer to the mesmerizing music-making Stag. The floor of the Heron Rookery was covered with blankets, and the evening was peppered with surprises and participatory offerings by ensembles of Gnomes, Mice, and Bears. Audiences were invited to wander in and out as they pleased—and to dream away the evening in this grove of contemplative delights. This participatory evening of music and contemplation featured pieces by Beethoven, Liszt, Scriabin, Debussy, Dvorák, Grieg, and other composer luminaries. Prelude to a Moon: Meditation of the Stag offered audiences of all ages and spiritual beliefs the time and space to embark on a reflective journey. Audiences lingered long inside this temporal urban cathedral—to find refuge and sanctuary in contemplation, remembrance, and gentleness. Prelude to a Moon featured Matt Goodrich, pianist and music director of Lucia Neare’s Theatrical Wonders. An evening for magic, dance and celebration. Lullaby for Rookery was a mythic, participatory spectacle intended to deepen Redmond’s public spirit. 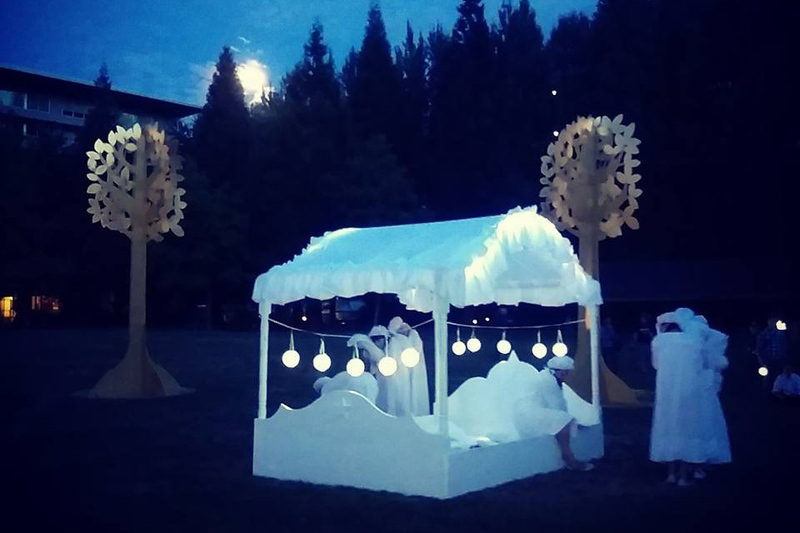 Audiences joined in free waltz lessons and a Twilight Processional through dreamlike installations along Redmond’s trails, in parks, and on waterways. Inside the Heron Rookery, revelers of all ages joined Neare’s celestial menageries in an arboreal rite. The night culminated in a Full Moon Ball with live waltz orchestra. The acres-wide work addressed the notion of public blessing and how we treat each other in civic space. Dream for Redmond was commissioned by the City of Redmond. Lucia Neare’s work was supported by an Impact Award from the Doris Duke Charitable Foundation.